It is fitted with a 125mm keyless guard that offers great cutting capacity and fast guard adjustment without using a spanner. 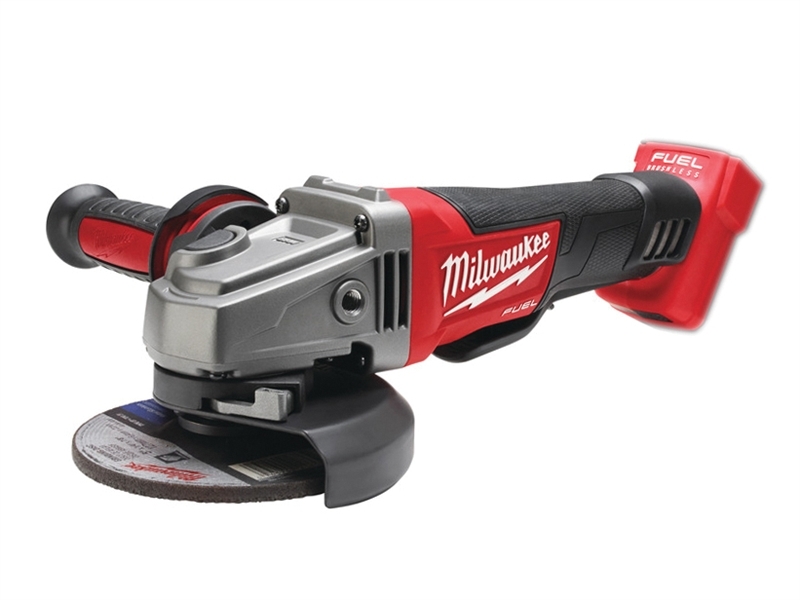 It has a 100% tool-free wheel change thanks to the integrated FIXTEC system. It is fitted with the slimmest handle design available on market and a non lockable safety paddle switch with line-lock-out function to prevent automatic start up. The removable dust screen to prevent debris entrance, prolongs motor life. M18 CAG125XPD-402C: 2 x 18 Volt 4.0Ah Li-Ion Batteries. M18 CAG115XPD-0: Bare Unit, No Charger or Battery. Sound Power Level: 94.2 dB(A). Sound Power Level Uncertainty: 3 dB(A). Sound Pressure Level: 83.2 dB(A). Sound Pressure Level Uncertainty: 3 dB(A). Vibration Grinding Uncertainty: 1.5 m/s². Vibration Sanding Uncertainty: 1.5 m/s².